BentoLunch.net - What's for lunch at our house: Spring Break Giveaway! Since we are on Spring Break this week and thus not making bentos, I figured it was a good time for a giveaway! Up for grabs is a *mini* Hello Kitty bento like Faith uses for snacks (see the post below with pineapples, strawberries and yogurt). It is 4.5 inches long, 3.25 inches wide, and 1 inch deep, with a fixed divider. 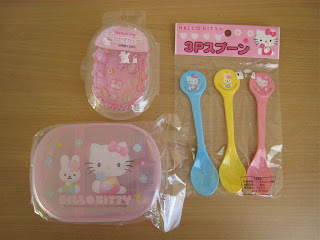 Also included are a pack of Hello Kitty spoons (pink, yellow & blue) and a pack of Hello Kitty food cups (similar to muffin paper wrappers). BTW: I love your blog! OMG! Too cute. Reba would love those! This would come in so handy! love it! want it! need it! My daughter would love those! Almost as much as I would! Love your blog!!! My Little Munchkin loves Hello Kitty, we need some accessories for her box. We are in! My kids love the corndog muffins! I would love to win this. You have inspired me and I have been lurking around. We eat at home most days but I try to make our lunch plates look the same. I would love this little bento for my DD 5. I love your blog! And my daughter would just love that giveaway!! awwwww how cute is that??? I don't even have kids, nor do I make to-go lunches for myself everyday b/c I work from home, but I am completely obsessed w/ your blog and I show my boyfriend all the cute little meals you prepare. I so want to be a bento-ing parent when the time comes! You've got to reveal where you get those egg molds from for boiled eggs...the boyfriend owns chickens and eggs are bountiful, it would be soo cute to boil them into shapes! Please put my name in the drawing!! Thanks so much!! Your blog gives me sooo many ideas!! My hubs gets dragged around on bento hunts!! I would love this box for my daughter. It is hard to find supplies in Georgia. Thanks for the chance to win it! Awesome and adorable! I'm in too! I shouldn't, but I will... haha I love the little hello kitty box! Where did you get it anyway? I am new to Bentos.... count me in on this giveaway! Those are absolutely adorable!!! Love your blog keep the words flowing. I LOVE Hello kitty and would love this? I make hello kitty's out of jicama for my daughter! I just started my bento blog in spanish: www.abracabento.blogspot.com and linked your blog to inspire others. Keep up the great work! Thanks for the lunch inspiration! Those are adorable, Emma would love those! DD loves Hello Kitty! Ofcourse, so do I. That's one of the perks of being a parent- you get someone to share the good stuff with! These would be perfect for her! I absolutely adored your blog. I'm stocking up on ideas for when my neice and nephew start school. I would totally love a cute little bento box. Cute! Love your blog : ) and Hello Kitty stuff too! My 5 yr old says that the Hello Kitty is sooo cute. my girls love Hello Kitty! Love the BLOG! Funny enough my boy would fight with his sister for that box! Love it and if we don't win, can you let me know where I can buy it? This set is sooooo darn cute! My daughter loves Hello Kitty, but the items are hard to find where we live. She would die for this!! I absolutely love this Hello Kitty lunch containers. Thanks for your blog...I love it and have signed on as a follower.